Republican presidential candidate Donald Trump waves to attendees upon his arrival at a rally held at Wright Brothers Aero in Vandalia, Ohio on Saturday morning. Although delayed by almost 50 minutes, Trump impressed the gathering by pulling up in and debarking from his private jet to walk the short distance to the podium on the stage. 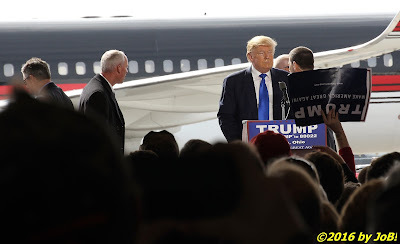 Speaking for nearly an hour, he touched upon many of the policy positions that resonate with is followers to include building a wall on the border between the United States and Mexico to stem the flow of illegal immigration and supporting the waterboarding of terrorism suspects. 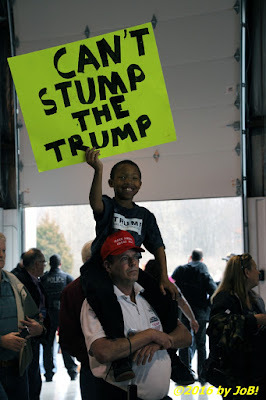 A Trump supporter and a young boy attending a rally held for the Republican presidential candidate at Wright Brothers Aero in Vandalia, Ohio on Saturday morning. 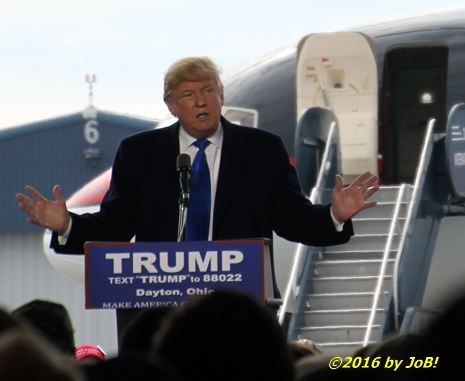 Due to recent polling showing Trump and Ohio Governor John Kasich in a very tight race, the billionaire brought up elements of Kasich's corporate biography and his record in office by connecting the former Lehman Brothers' managing director to the 2008 recession and highlighting a heavy reliance upon hydraulic fracturing or "fracking" when explaining the state's economic recovery since 2010. He also called him an "absentee governor" due to the amount of time Kasich has spent out of the state to campaign for the presidency. This was the first Trump event since Friday night's rally on the University of Illinois-Chicago campus that was postponed due to security concerns after violence broke out between protesters and supporters inside the venue. At least half a dozen individuals were escorted out of the morning rally for attempting to interrupt the event with one local man taken into custody after leaping over a security barrier and getting to within 10 feet of the stage. Secret Service agents briefly heightened security by surrounded the candidate as a protective measure and the rally was allowed to continue after that delay. 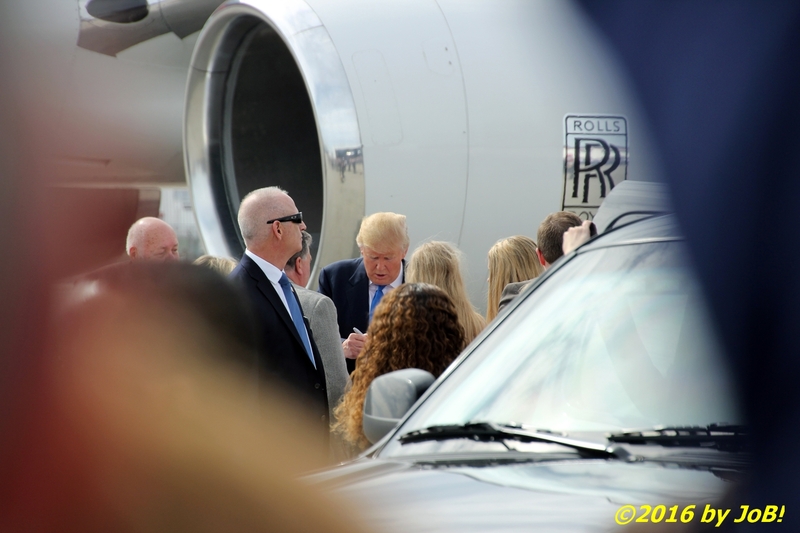 Republican presidential candidate Donald Trump signs personal items prior to boarding his plane at the end of a rally held at Wright Brothers Aero in Vandalia, Ohio on Saturday morning. 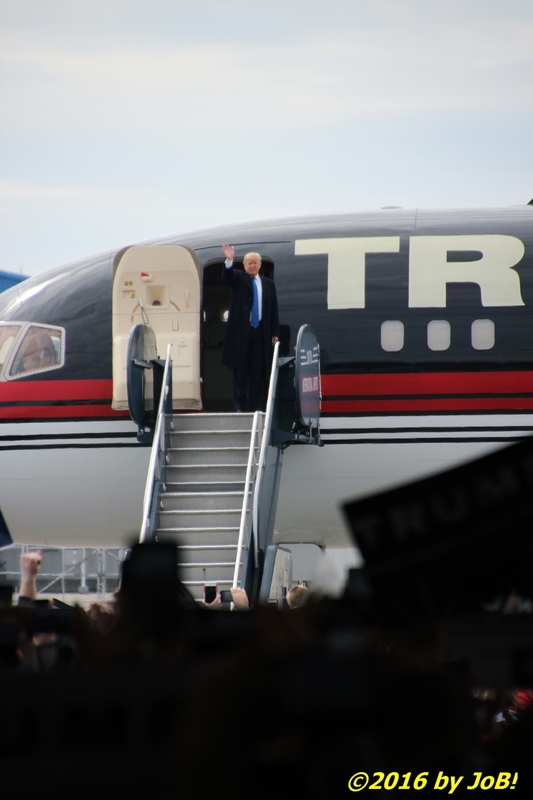 At the conclusion of the rally, Trump was escorted along a fenceline to greet attendees and to sign personal items for supporters on the way back to his plane. 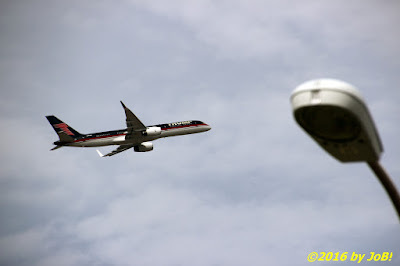 He departed the area shortly before noon to attend another rally in Cleveland in the early afternoon which is scheduled to be his last in the state prior to the Tuesday election. Republican presidential candidate Donald Trump's private jet departs Dayton for an afternoon event in Cleveland after a rally held at Wright Brothers Aero in Vandalia, Ohio on Saturday morning.